Today's mission is to declutter under the bed in whatever bedroom you're currently working to declutter and organize. You'll do this mission separately for each bedroom, or bed in a bedroom, in your home that you work on, both for adults and kids. 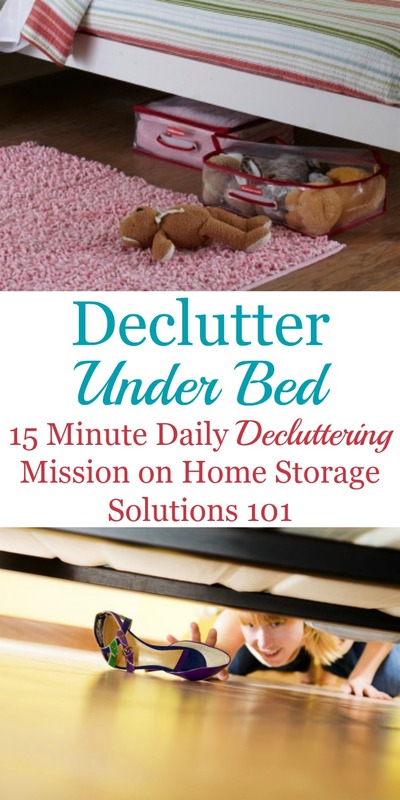 This mission is designed to be done while working through the Bedroom Organization Challenge here on the site, which is part of the 52 Week Organized Home Challenge, and again when doing the Kids' Bedroom Organizing Challenge a few weeks later. Of course, you can do this Declutter 365 mission whenever you want or need to, and frankly, especially for kids, this is really the type of mission you should probably do more regularly than just once a year. The mission itself is pretty self-explanatory. While we're focused on decluttering the bedroom a prime place that needs to be cleared out for many people, both kids and adults, is under the bed. So that's what we're doing today. 1. Things you've stored there. 3. Dust bunnies, cobwebs, and other items that need to be cleaned up. We'll talk about all three categories, briefly, here in this article. For the first category of items, things you've got stored under your bed, I want you to pull out what you've placed under your bed and evaluate whether you really want to keep it, period, and if so, if you still want to keep it under the bed. Under the bed can be a good place to store items that are used infrequently, if you don't have much other space for storage in your home, but it is not a very convenient storage area, and can get quite dusty, so I only suggest using this area for storage if you really really must. to get to anything, it often is a place you "store" something and then forget what you've even got under there. Anything you've placed into this space but then you have not needed or accessed again within 6 months to a year you should seriously consider getting rid of, permanently. Further, as you do more and more of the Declutter 365 missions, and therefore get rid of excess stuff and have more storage space elsewhere in your home, you may also decide that you no longer need to store anything under your bed at all, since you have a more convenient space somewhere else. The second category of items you may find under the bed include items you've been looking for, but then had assumed were lost. I have no idea how these things end up under the bed, but they do. It's kind of like when you declutter under your couch, and you have a treasure hunt. You can find missing socks, or pets may carry items up there and stash them, or in the case of your kids bedrooms, who knows what you'll find, from toys to library books, and more! Any items you find under there that don't belong, put back into their rightful spot in your home, or declutter, depending on what it is. I'd love to hear what you find under there when doing this mission, so tell me below in the comments! Remember, just declutter under one bed at a time, and repeat it for each bed in your home. You can wait until we work on kids' bedrooms later in the challenge to do those beds if you wish. Finally, the is the third category of stuff I mentioned that you'll find under your bed -- dust. There will most likely be a LOT of it, it's a prime spot for it, for reasons I'll explain below. 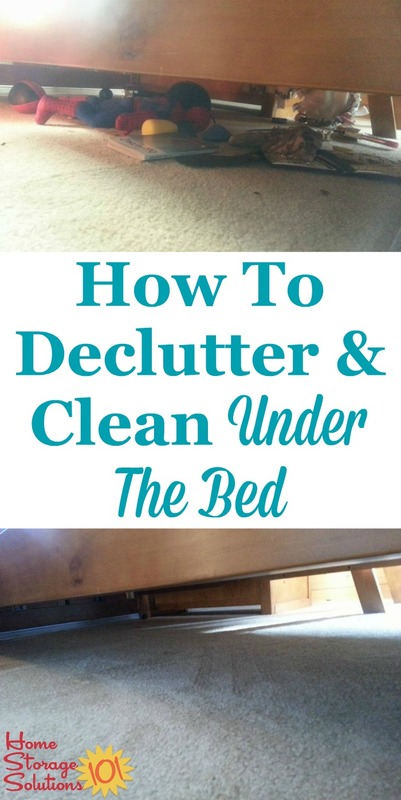 Once you've cleared out the clutter from underneath your bed you should take a bit more time to clean under there, since you don't get the opportunity too often. Below I've provided some tips for how to do this. 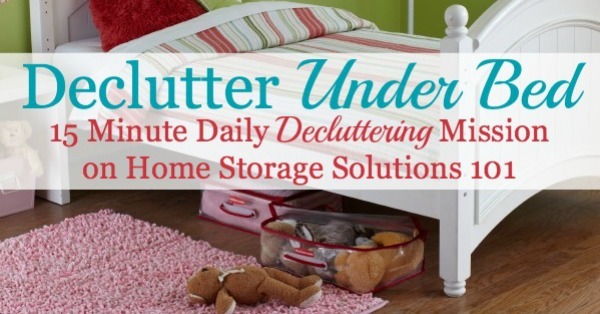 After you've decluttered and cleared out everything underneath your bed, and before you put back anything under there you've decided to store in that space, it's a good idea to clean under your bed. The reason is, as I mentioned, it is likely to be quite dusty under there and in need of a good cleaning. Finding lots of dust is really no surprise because wherever someone sleeps is a prime location to get dusty. After all, a lot of dust is (don't get to grossed out when I say this) dead skin cells, and you slough off a lot of those as you sleep each night. It's only natural a lot accumulates underneath the bed. 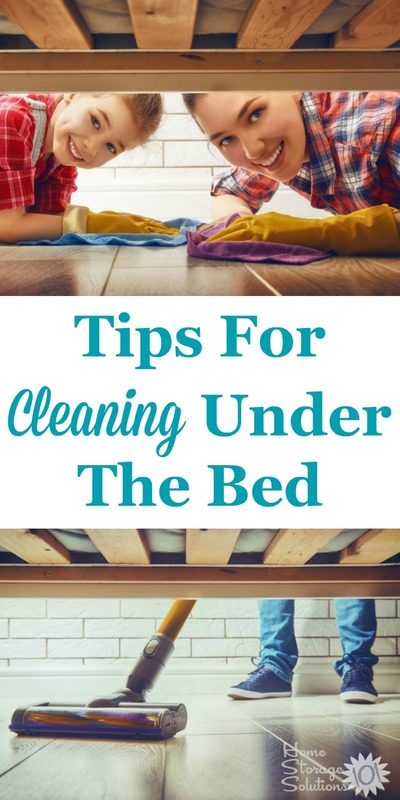 Therefore, getting in the habit of cleaning under the bed regularly can be important, especially for those who suffer from dust related allergies. When you decide to clean under your bed it is also a great time to take off the bedding on your bed, including not just the sheets and pillowcases, but also the mattress pad and dust ruffles, to really get rid of a lot of the dust all at once. Most of your bedding can be laundered, and while the bedding is off the bed I recommend vacuuming your mattress to remove excess dust from there as well. You can read the article on the sister site, Stain Removal 101, at the link, for more information about that task. To clean underneath the bed itself isn't difficult in one sense, and in another it's a big pain (which is why we don't do it too often). Vacuuming is the best way to remove dust from your home, on either carpet or hard surface floors (for hard surfaces just make sure you're using a vacuum that is safe, and non-damaging for that floor surface). And generally vacuuming is easy, which is why I say, in one sense, cleaning under your bed is also easy. However, what makes it difficult is that the bed is quite low, and so it can be difficult to reach under there with the vacuum to adequately vacuum the floor. The best way to deal with this issue is to move your bed, vacuum, and then move the bed back into place. That is often easier said than done as well though, because beds (and mattresses) can be quite heavy and cumbersome to move if you don't have strong help. Therefore, other ways to reach under the bed without moving it include using the attachment of your vacuum to reach farther under there, using a broom or dust mop to sweep much of the dust out from under the bed to then vacuum up (which works best for hard floor surfaces, not for carpet), or to get a smaller stick vacuum or robotic vacuum which can reach into these lower clearance spaces. Along with vacuuming, make sure to also dust the baseboards and lower walls around your bed as part of this mission, since these areas can often be neglected if your bed is close to the wall. Also, make sure to dust the headboard and other parts of the bed itself. Below I've added some photos from readers who've done this mission to get you motivated to do it yourself. You may not see under the bed very often, which can make it easy to forget, but you'll literally sleep better once you clear out and then clean up this space! 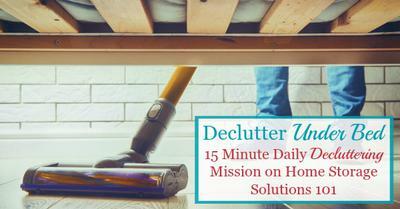 Many readers have already done this mission and gotten great results in their home. Here's a couple who've sent in photos to get you motivated to take on this challenge too, for yourself! The first photo, above, was sent in by a reader, Amanda. 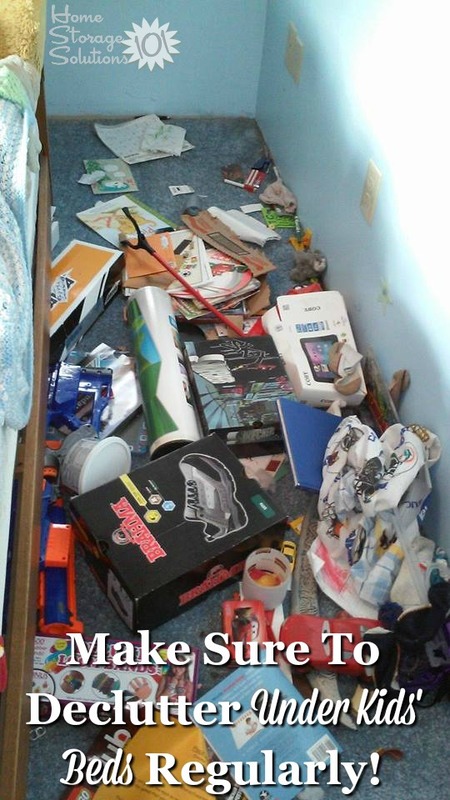 She said about the photo, "my son's room today, under his bed. All clean now." Yay Amanda, it's good to know you got all that cleared up with just a few minutes of work. These photos are from another reader, Laura. She explained of the two photos, "Here's the before under my 9yrs bed," and then she posted just a few minutes later, "And here's the after..we even shampoo'd the carpet." Look at the difference! Great job, Laura! Finally, after you've decluttered and cleaned underneath your bed, if you do decide that you're going to place any items under the bed for storage do yourself a big favor and place them inside under the bed storage containers, instead of just loose under there. The reason is to protect these items from the excess dust found under your bed. If you care enough about items to store them, you want to do what's necessary to protect them. 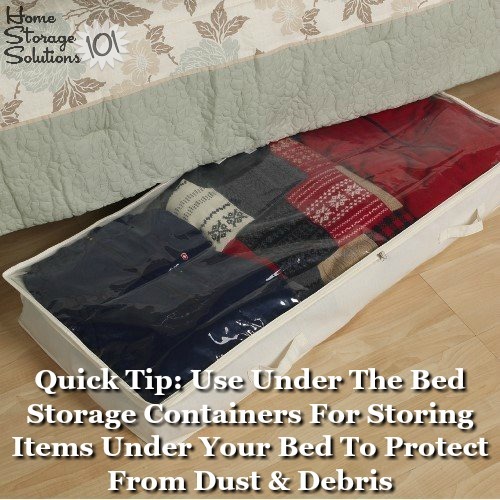 This is especially true for clothes and bedding that you store under there, because otherwise you'll need to wash these items before you can even use them the next time you pull them out. I hope seeing these pictures has inspired you to clean out and declutter underneath your bed. My dogs sleep under the bed, so we keep it pretty clear although we do end up collecting quite a bit of hair!! We use a couple of the long clear storage bins. One has pet shop stuff. Another has Barbie stuff. We have a couple of smaller ones with doll things in them. what I found under there! I have three leafs for my table. I keep clothes packed in space bags under my bed, kept from child number one for child number two (between which there is a 6 year age gap). We use the long rolling storage bins, 4 fit perfectly under each of our daughters beds. I got them daybed "frames" as they are a bit higher off the floor so they are able to use the bigger storage bins that way. They use the bins for all their clothes, all out of site leaving their rooms to look more open and tidy it's also great because since it's not just open space under there they are unable to just push stuff under their bed. We also have some long storage bins under our bed however we have the smaller ones without wheels as our frame is a bit lower to the floor, they still pull out easily. Every bed has one storage bin with the appropriate bedding (sheets, pillowcases, etc). It helps the kids make their own beds and keeps it organized! I don't keep things under the bed, especially since my little dog started using the space as his hidey-hole for treasures. Toys, chewies, and items stolen from the dirty laundry were one thing, but critters he smuggled in from outside... GAG. I put risers under the legs to make it easier to get up out of the bed. The bonus: That made it even easier to clean underneath bed and to quickly do a "What did you put under there NOW?!" patrol.